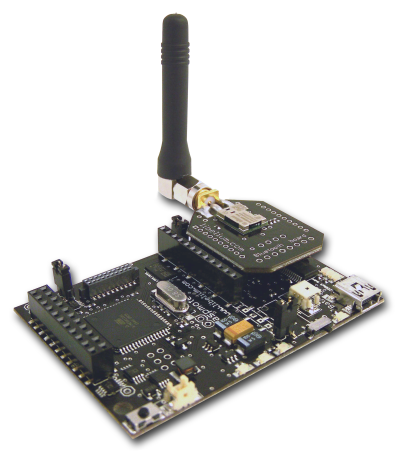 Libelium announces a new Bluetooth module for the Waspmote wireless sensor network platform. This module enables wireless sensor networks to be directly linked to portable devices such as smart phones and laptop computers. This capability is particularly useful for medical applications and for industrial diagnostics. Additionally, when combined with the Meshlium multi-protocol router, it supports the deployment of hybrid ZigBee- and Bluetooth-based wireless sensor networks. The new Bluetooth module extends the Waspmote platform by offering a new choice for radio communication. The platform is extremely modular allowing the use of a wide range of modules for both wireless communication and sensors. Now WSN users can choose between a Bluetooth module and a range of ZigBee modules covering the main frequency bands (2.4GHz, 868MHz, 900MHz). Libelium CTO David Gascón says, “This module will be particularly useful for medical applications requiring the integration of biometric sensors and for sending sensor information to Bluetooth-equipped industrial systems”. He adds, “Users with existing Bluetooth-based infrastructure will be able to extend it to include Waspmote and its range of sensors”. The new module exploits key features of the platform such as power management. The Waspmote internal microprocessor minimises energy consumption by switching the radio module on and off at the necessary intervals. The new module is able to send sensor data frames to smart phones that support Serial Port Profile (SPP). Security mode is implemented with PIN validation which can be preconfigured such as a “Network Key” and it allows the management of a Trusted Nodes list in order to create secured networks. 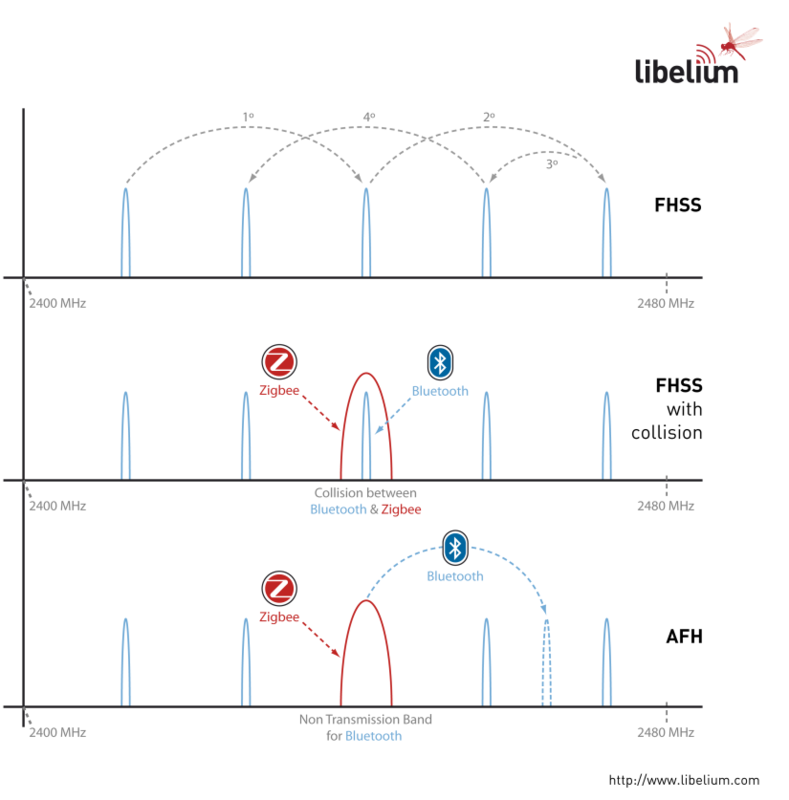 Waspmote users are also now able to build hybrid networks with both Bluetooth and ZigBee sub-networks if they use the Meshlium multi-protocol router to bridge between the sub-networks. With both Bluetooth and ZigBee using the 2.4GHz industrial, scientific and medical (ISM) radio band there is the possibility of interference. For this reason Waspmote enables Bluetooth and ZigBee communication to work in the same environment by using Adaptive Frequency Hopping (AFH) which enables the Bluetooth radio to dynamically identify channels already in use and to avoid them. 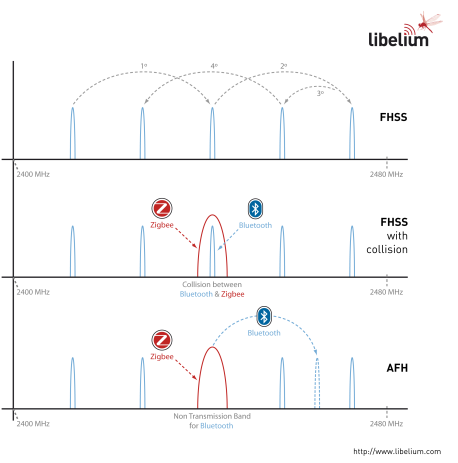 In the figure below we can see how AFH avoids transmitting in frequency bands which are being used by DSSS technologies such as ZigBee and Wifi networks, allowing a complete coexistence between all them. Users are able to flexibly change a device between ZigBee and Bluetooth as all the modules use the same kind of socket on the Waspmote board. The platform has an open source API and programming environment; new libraries are available to support the Bluetooth module. Remember that Libelium is exhibiting next week at Sensor+Test (“17th International Trade Fair for Sensorics, Measuring and Testing Technologies”) from 18th-20th May 2010 in Nuremberg, Germany. The Waspmote and Meshlium products will be demonstrated in Hall 12, stand 12-227. Every day at 13:30-13:45, Libelium will show the wireless sensor network Waspmote platform in the Action Area. On Thursday 20th May at 9:30-10:00, Libelium CTO, David Gascón, will present “Waspmote, a Sensor Device Platform for developing Wireless Sensor Networks (WSN)” as part of Programme Hall 12.